This is the third sink I have bought because they so great. Buy this sink, you will not be disappointed. Heavy gauge stainless steel make it quiet and solid. it doesn't go "boing" when you drop something in it. Worth 3 times as much. I would recommend this sink. This sink is stunning to look at. I really love the size of this sink. It makes cleaning large saute pans & soaking big pans very easy. HOWEVER, I have to give it 2 stars because the sink is irregular in size. It was noted as 17 inches interior - one the left side this is true. On the right side it measures 16.5 interior. Of course I did not discover this until after my counters had been cut for the sink using the provided template. And since the sink is now epoxied onto the counter, it would be a giant pain to return this item. If you decide to purchase this sink, make sure you measure it for accuracy before having your fabricator cut holes in your counters. Also, my fabricator said that Kraus templates are usually designed for a positive reveal - just an FYI to discuss your preference for reveal with your fabricator & then tell them to use the actual sink - not the template! We purchased this sink to replace a double bowl Stainless Steel sink already mounted to our granite counters. The old sink was simply to small for our daily needs. I would have preferred the 30", but our old sink cutout required we go to the 32" instead. Overall it is a beautiful sink and we are very happy with the purchase. The interior rack works wonderfully to allow food to flow into the drain. It also allows our sponge to drain without the need for a separate sponge holder attached to the inside of the sink. Even our largest pans fit, in fact our largest pan and a large pot fit in it together. The only cons I can see so far are: 1. It is a little noisier than our old sink, they didn't put any sound deadening material on the bottom and the steel is slightly thinner. I will be putting some automotive sound dampening material on it myself. Purchased for $20 at a local stereo installer. 2. The strainer it comes with is very attractive, but it won't fit a garbage disposal. Someone at Kraus needs to change the bottom to make their strainer standard for garbage disposal connection. We just reused the old one, which I did myself in about 20 minutes. 3. Installation was somewhat messy. This is an undermount sink, which meant our counter needed some additional cutting to make it work correctly. This produced a lot of dust. Not a big deal if you are installing this from the initial countertop install. Even with these few minor issues I would do it again in a heartbeat. Very beautiful design and definitely heavy duty with the 16 gauge. Padded and Stone Guard undercoated insulation does help reduce vibration noise from disposal during use. Maybe it's just the sink I recieved but just after 2 days of use, I did notice the Satin finish is being scratch off just by droping in the utensil. So the "Scratch-resistant commercial-grade premium satin finish" isn't really scratch resistant. I am still happy overal with the sink but just wish it wouldn't scratch that easy. Just got to be very carefull what you drop into the sink. Still definitely a recommendation for anyone looking for a sink for their kitchen. I love my Kraus 32 inch undercount single bowl sink. It's big enough to fit large cutting boards and stock pots. It's very deep, durable, easy to clean, stainless steel looks flawless and the grate is very useful. We paid extra for the fancy drain cover but ended up not using since we installed a garbage disposal. The sink is well worth the cost which is much less than other brands. It arrived very quickly thanks to Overstock.com. Every purchase from Overstock.com has been easy and all the products were high quality. Thanks! The other reviews are right on point. This sink is large. Very large. My contractor laughed at it's cavernous size. That said, it fit in my standard cabinet with no issue. Make sure your faucet has enough room for the handle to have full rage of motion without hitting the back splash, as the depth of this sink does not leave much space with the typical 24" cabinet depth (easily done with some forethought and coordination). Although the sink states 16 gauge stainless steel, it seems more like an 18 gauge. Maybe a little nicer than the normal 18 gauge, but not as quite as beefy as the $1,000+ 16 gauge sinks you will find in the store. Also, it's not incredibly padded on the underside. Not a ton of clanking, but we might add some spray in insulation (a recommendation of our granite guy) around the base, within the cabinet, to make it super quiet. Beware of scratching. It's definitely not scratch proof. We have only had it installed for two days now, so can't attest to longevity. At the moment, it just seems like the sink should always have the protective grate at the bottom. The overall take home, this sink is an excellent value for a great sink and we are very happy. I finally had this installed when I renovated my kitchen recently (had been in my basement for 2 years.) It was shipped well and the packaging fully protected everything. I love the grate to protect the bottom, however I could not use the Kraus drain/colander strainer provided due to the existing plumbing. It is too deep to fit on standard height p-traps - but it is also S/s on the top and has a molded plastic barrel drain at the bottom connector (as others have mentioned). Not so sure how that would hold up over time. The sink itself is huge and I love that most splashes are contained inside it as I wash large cookie trays and casserole dishes. I opted to upgrade to a modern style high end faucet, and did not regret as it completes the look. This sink looks great and was easy to install. This is a good quality stainless steel and the satin finish really helps with scratches. We've had the sink installed for a week now, and so far, I would highly recommend this sink! This sink was delivered so quickly and had been sitting in my garage waiting for my remodel. It is big, but I had measured my old drop in sink and other than it's depth, it was pretty much the same length and width, except this sink is way more efficient. Because of it's depth I ordered a compact garbage disposal and was able to fit the sink, disposal and a 4" roll out tray under the cabinet. I use a product like BonAmi/Bartender's Friend to clean it with a Non-Scratch Pad (exactly what I use on my cookware) and it works well. I ordered an optional sink colander and that came in handy. When I'm not using it to rinse produce etc., I use it to drain my dishes. Excellent quality seen in a high end plumbing showroom for $899. Notice the gauge is heavier than ordinary stainless sinks. I've had stainless sinks before that do not clean up nicely. This one is a dream! The channels pictured are perfectly balanced to direct any standing water right down the drain. And it is absolutely huge. Very deep, so fits huge stock pots, etc. If you are rather petite though, you might have a hard time reaching the bottom.We had granite installed (no new cabinets) and this sink so totally complements it everything looks brand new. We now have a really high end looking kitchen for a fraction of the cost. We recently renovated our entire kitchen. 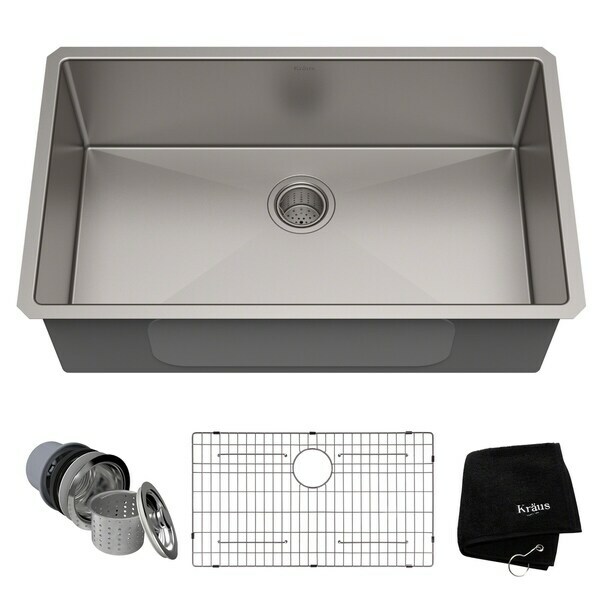 After searching diligently for a sink, we decided on the Kraus 32-inch undermount single bowl after reading so many positive reviews on this sink. I will have to tell you that all the reviews are right! The sink is amazing. Even the granite installer said it was a fabulous sink and thought we paid at least $$$$ for it. It is beautiful and will make quite a statement to any kitchen. I was not sure it I wanted a single bowl as I was used to a double but I am glad I made the change. It is so huge. I just love it. After searching EVERYWHERE, I decided that this was the best value for the quality of sink I was looking for. I was replacing a white double-bowl porcelain sink that I adored. It did take a few weeks to get used to, but now that the whole family has used it for about 2 months now, I can safely say, we love it. I am constantly cleaning the water spots out of it, but that's just me...I did the same with the white porcelain. (Yes, I'm Type A). I like the fact that the corners are NOT zero radius. I have a small prep sink that is, and I like this one with the slightly rounded square corners much better. It does make clean-up much easier. The grid is a must, so glad it came with one. The only problem is now I dont have that center piece between the bowls for my dish rag to hang! This sink is high quality! Haven't installed yet, but very pleased with appearance. Everything I order from Overstock arrives quickly with no problems. So happy with all my purchases!! We just had this installed and we're very happy with it. It was difficult to find a 16 gauge stainless steel sink without breaking the bank. This one has it all and you'll be happy you bought it. beautiful and solid - this is the second one we have purchased and are very pleased. Looks Great! High Quality Sink! Love the look, looks great in my laundry room! I have used this sink in three kitchen projects. It looks very high end. It is easy to clean and is very durable. Highly recommend! I LOVE this sink! Highly recommend. Love it!! I love the ability to wash larger pots and pans without singing the sink or countertop! This sink is just what I was looking for. It is so big and depth is perfect. I can load this puppy up with water and let my dishes sit without the worry of having a smelly kitchen. I’ve received so many compliments. Perfect size, great quality and easy to clean! For the price what more can you ask for! it was so nice to finally have a single basin sink big enought o soak a big baking pan! Great sink. I use these often on kitchen remodels for clients. Have had in my own home for four years and still in perfect condition. Would definitely recommend. Good sink, comes with a really cool drain compartment and accessories. Unfortunately, we weren’t able to use the drain components as it bring the unit too low and we would have had to re plumbed the drain’s line. My only complaint which is minor is that if cast iron is left on it more than a couple hours, it can stain. Also, it’s slightly difficult to get food out as the drain elevation is so subtle, it take a little while for food/water to make its way down. Otherwise, good for the price. It’s been three years with this sink in my kitchen, and it’s working great! The stainless is very durable and cleans up nicely. The sink felt awkwardly deep at first, but I have come to love the versatility and the way dirty dishes are hidden from view. Ordering this myself really helped save some money on my professional kitchen remodel! This sink is good if you want something huge almost industrial or at least from a restaurant. My sink cabinet has a support metal bar on the back and it did not leave enough space to fit my faucet. I took a picture with by biggest pots inside and you still have left over space. "can this sink be used as drop it? H.C."
"Our cabinet width is 32 inch. Would this 32 inch sink fit? What is the minimum width required to install this sink?" The minimum size base is 36 inches. The recommended base size is 36 inches. "32" is ourside dimension or internal? What is the internal opening dimensions? I need internal opening is 30" . " Internal dimension. Slightly, very slightly smaller than 30". "Is this sink 18 gauge 304 stainless Insulted tub so it's quiet The island measures 50"x98" Size of this sink recommended?" I installed this sink with a 1hp disposal and it is extremely quiet. I love the look and it looks great in a large island. Have had many compliments and a great value. "Is there a colander that fits this sink?" I am not sure but this is a wonderful sink. Just be are that it is very deep. As far as quality, it is wonderful and heavy. My husband is a contractor and is very impressed with this quality. I bought an expandable stainless colander/strainer at Bed Bath & Beyond and it works great. "The cabinet spec says at least 36". Is that the outside of the cabinet or the inside? My 36" cabinet is only 34" on the inside. Will the Kraus KHU100-32 fit or do I need the Kraus KHU100-30?" An internal cabinet size of 34 - 35 inches would be ideal for this sink. "Can you tell me what faucet is pictured?" You can find that faucet under item# 17570614.